Wayne Staab, PhD (and official Canadian Audiologist Audiology Historian) and Robert Traynor, PhD will alternate Stories from our Past which are about technical innovations and approaches that are now ubiquitous in our field or were important in the development of our field. In many cases, these stories will be written by the innovators themselves. Movie viewing has been enjoyed for decades. During this time, there have been significant improvements in films, especially related to sound and color, making movie-going a richer experience. While both have been significant, this post is directed at the sound portion of movies which seems to have encountered significantly more concerns than color processing. Numerous accounts, anecdotal and measured, indicate that the sound volume of movies is often too loud. This had been especially true for advertisements and upcoming attractions, but now the general levels encountered during the film itself have been questioned. That being the case, what are some of the issues related to these reported high sound levels? Unlike former analog sound, current digital sound is said to not distort/overload at loud volumes and can therefore be increased to extreme levels without static, fuzziness, or distortion – less likely to reduce sound quality. One way to say this is that digital sound helped to create greater headroom, meaning that the dynamic range between low-level noise and the upper distortion level was increased. As a result, making sound louder with digital is less likely to reduce sound quality. Unfortunately, a consequence of this greater headroom is that movie producers, studios, and directors are generating soundtracks at very high sound levels – levels that can definitely be annoying, and could potentially be harmful to hearing. Audience complaints about movies being too loud2,3,4,5 with even well-respected movie sound mixers commenting on the problem. Theaters are playing films below the calibrated level. Trailers are fighting for competitive loudness. If the level is set for the movie, trailers are believed by some to be at a disadvantage because their loudness level and exposure is not emphasized. Sound mixers are using hearing attenuator pads to avoid the risk of hearing damage to themselves. Has led Europe to a uniform measurement technique and a self-disciplined constraint. How Loud is a Movie? Individual annoyance level acceptance. Not everyone has the same loudness annoyance level, which makes this a non-practical feature to employ for films or for movie theaters. Loudness is essentially a psychological correlate to the physical strength of a sound, its amplitude. It is a subjective assessment. The measurement equipment used. Conventional level meters may provide only marginal help. Slow measurement settings of VU meters are of little use in detecting short-term peaks. Regardless, neither VU meters or PPMs (peak program meter – designed to provide short-term peak levels) provide effective loudness monitoring. The scale used to measure the loudness. Various scales using different frequency weighing have been used, with the most common shown in Figure 1. Figure 1. This graph shows sound measurement weighting curves relevant to this post. The “A” weighting is originally based upon the 40 phon frequency-dependent equal loudness curve for human hearing, and is currently used also in Sound Level Meters (SLM) to predict potential hearing loss from environmental noise. The “C” curve was originally based upon the 100 phon curve, represents the overall levels needed along the frequency scale to reach equal loudness. The C-weighted sound level does not discriminate against low frequencies and measures uniformly over the frequency range of 30 to 10,000 Hz. This weighting scale is useful for monitoring sources such as engines, explosions, and machinery and finds some use in electro-acoustic system calibrations. The “M” curve stems from Dolby and is based upon the CCIR curve which was developed for measuring the annoyance of noise. It is now used by some to measure commercials (not trailers) in cinema. It has been used primarily in the UK and Europe, whereas the A-weighting has been used in the US. The “K” weighting was developed for subjective loudness estimates of electrical signals and not of interest in this post. (Graph and descriptions from Thornton6). Another measure of sustained loudness is called Leq(m), the maximum permissible level for a trailer, with (m) indicating that this is an average level of a two or three-minute trailer. This level was derived to allow trailer levels to be used that would not disrupt the levels of the feature film that followed. Leq(m) could be defined as the level of a steady-state tone with the equivalent level in terms of potential hearing damage as a level time-variant signal,6 but that was not the real incentive. For example, loud sounds that are short in duration may cause great surprise, but little annoyance. Also, a sudden gunshot in the middle of an otherwise quiet desert scene causes little in the way of complaints, even if very loud, but sustained gunshots can. Leq(m) quantifies sound with an emphasis on the frequencies that are most annoying to audiences. So, rather than simply measuring sound volume, the standard seeks to measure annoying volume. A number of different formulae define Leq(m), but all average the level of the signal over time. This post will not attempt to define the various formulae. In general, the Leq(m) is an integral formed of accumulated sound pressure levels and divided by the duration of the sampling process. Filtering is used in this measurement that generally emphasizes the mid- and upper-range sound frequencies (TASA Standard). The mid-range is considered most annoying to listeners, and is said to include sounds such as breaking glass, shrill voices, and fingernails on a chalkboard. How this works is described generally in the following way; primarily mid- and upper-range frequencies would result in a high Leq(m). However, because the measurement is integrated over the entire length of the feature, a densely-paced feature with high volume throughout would have a higher Leq(m) than a slower-paced feature with more quiet spaces between the high volume sections. The current upper volume recommended for trailers, in order to bring them closer to the features they precede, is an Leq(m) of 85 dB. However, it is unclear to this author that the Leq(m) is recommended for full-length features. Regardless of the method for measuring the loudness of the cinema, much can be learned just by looking at the curves they represent. It is helpful to look at the total area beneath the curve as representing the loudness. It is easy to see, therefore, that the overall loudness depends upon which of the curves is used to make loudness measurements, and of course, the frequency spectrum of the sound cannot be ignored. In the mid 1970s, Dolby Laboratories introduced a calibration recommendation to monitor cinema loudness levels. A reference pink noise was introduced into the recorded chain to which the audio monitor level was adjusted to 85 dBC. This could be used by those theaters that were equipped for playback of the new stereo optical soundtracks1. This meant that movie theaters playing films at that calibrated fader setting would reproduce the volume levels selected by the film director and audio mixers in the dubbing setting. The films operated using limited headroom, and the resulting constrained dynamic range meant that there were very few complaints of “too loud’ films. In more recent times, the advent of digital sound extended the headroom across the frequency spectrum, but with more in the low and high-frequencies. However, because the 85 dBC calibration technique has been maintained, extra headroom was available for use. It should be no surprise that “non-associative” (associative meaning that when there is no competition between music or effects is present, the dialogue is leveled to be a close match with the visual) loudness of effects and music has risen to fill the available space. And, as might be expected, the extra headroom was not always to the benefit of the film or to movie goers. It tended to be filled with greater loudness. During the analog sound period, a practical (not mandated) limit of 85 dBA SPL without distortion had been followed somewhat, but not regularly. This level tended to be related mostly to the U.S. Federal Occupational Safety & Health Administration (OSHA) who required hearing protection in noisy work environments at 85 dB SPL. However, its regulations did not apply to theaters, where peak noise levels have been reported as high as 133.9 dBA.9 In general, cinemas are sometimes disguised to follow the OSHA standard, but numerous movies cast doubt on the veracity of this application. Noise experts contend that a person can sustain permanent hearing loss from a single rock concert, and some movies produce comparable levels. 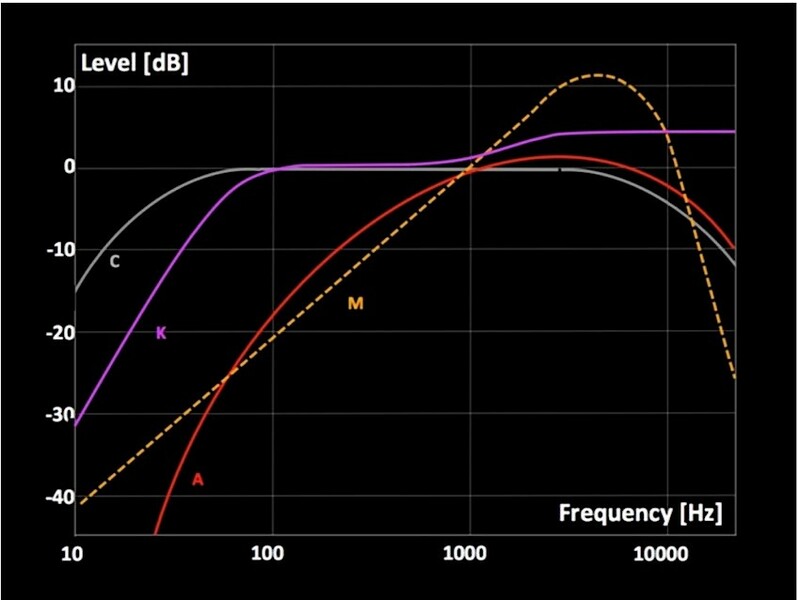 Levels above 115 dB SPL are considered never safe, even for short durations, and sustained noise above 90 dB SPL can potentially damage one’s hearing. Many movies, especially those that involve action exceed these sound levels, and several issues make it difficult for moviegoers to expect much change. Why Are There No Standards? No regulation.There is an overall standard for industry in general, but no current regulations on sound levels for theaters. Stories abound stating that soundtracks for movies in theaters are set far above the suggested 85 dBA SPL level. Opposition. The MPAA (Motion Picture Association of America) is strongly against legislation to regulate the sound levels of movies in theaters.13 In opposition, the State of Connecticut is working to regulate the level of movie sound, but the MPAA counters that this violates the First Amendment right to free speech.14 They claim also that regulation would be discriminatory because it would focus on movie theaters, and exclude other loud events such as rock concerts or sporting events. The Magic Number “7”. The table below provides a reference that is useful in understanding what some of the volume numbers often referred to represent, and goes back to the days of 35mm film. 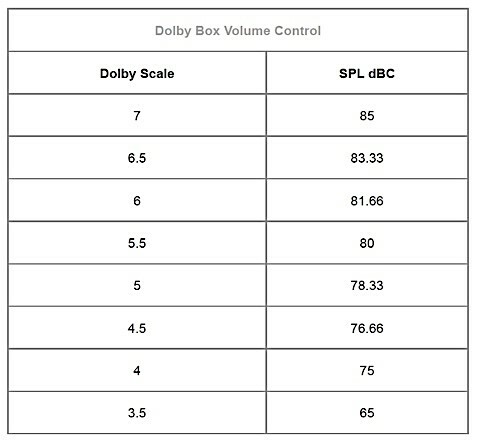 This table shows the Dolby Box Volume Control Scale on the left and the comparable SPL dBC on the right. The Dolby numbers refer to the fader knob that controls the volume level in theaters. Theoretically, 7.0 plays the film at the level at which the sound was mixed. If the playback level is set too low, dialogue may be hard to understand; too high a level may cause complaints from the audience, and under extreme circumstances, can damage the theatres sound system. (From Dolby CP650 Manual). But along the way, something went wrong. The original standard for commercials and trailers was 82 Leq(m), which is about 6 dB above the dialogue level. Later, the standard nudged to 82 Leq(m) for commercials and 85 Leq(m) for trailers, or 9 dB above dialogue. However, it is not just commercials and trailers that are now played back much lower than 7. Cinemas have responded to complaints of the main movie being too loud and have responded by reducing the level of the main movie as well, giving good reasons for continued complaints related to conflicts between dialogue and music/effects. An ironic dilemma confronts the feature film audio industry. Part of the problem has resulted from the proliferation of powerful digital audio technology used in the mixing and playback feature of sound tracks. Many theater playback systems allow dramatic high-volume sound tracks to retain their sound integrity, as mixed in the studio. Some filmmakers think that if they have a high sound volume story to tell (or, which is often, a weak story to hide), that a booming sound track will obscure the difference. If a movie director doesn’t have something interesting to say, but is being paid several million dollars to say it, there is an enormous temptation to yell it as loudly as possible, hoping that intensity will substitute for depth. Might this be a reason why some producers, directors, and studio executives demand that sound engineers mix movie sound tracks louder than ever because theater owners are turning the volume down to satisfy customers? The unfortunate consequence of turning down the overall volume of high level movie tracks to satisfy customers is that the quieter parts of the film, such as normal talking, are difficult to be heard, and whispers, are anyone’s guess. Coupled with the observation that more and more movies are being filmed in essentially dark studios (undoubtedly done to cut down on costs associated with designing elaborate sets), both sound and vision are compromised. Today one feels as if a flashlight is needed to view a movie, even when the sound can be heard. Because of the issues surrounding film volume levels, many sound pros (not filmmakers) have taken part in an informal, but growing debate over how to safely retain creative control over the sound mix, and much of this can be found on the Internet. Contributing to the problem is that other “new” noises are making their way into audio facilities, according to Mark Curry, chief recording engineer for Hollywood-based Music Forever, an audio production and recording company. “Every studio has computers,” says Curry. “All those machines have audible hard drives and fans and other things, unless you have wired them to a dedicated machine room. That creates lots of whines and buzzing from those machines. Sound effects are all played by Pro Tools these days, so even on the dubbing stage, they wheel computers right in. That has resulted in lots of ambient noise levels, more than ever before. That also causes filmmakers to ask you to play the tracks louder” to overcome these ambient noise levels.17 Additionally, not all theaters have the same dimensions and acoustics, with some having greater or lesser damping, and or reverberation, all of which will change the measured levels. A trailer, or preview, is an advertisement for a feature film that will be shown in the future at a movie theater. The term “trailer” comes from their having been shown originally at the end of a feature film. That practice was disbanded years ago because patrons tended to leave the theater after the film ended. But, the name has remained, even though trailers are now shown before the film. When stereo and multi-channel digital emerged, loud trailer sound became the number one complaint in movie theaters. The trailers were designed to be much louder than the films they preceded. For advertisements and upcoming attractions, the marketing belief has been that the louder the sound, the more attention is paid, and the more likely it is to be remembered – resulting in product purchase or future movie to be seen. “…the trailer will always sound louder than the feature. 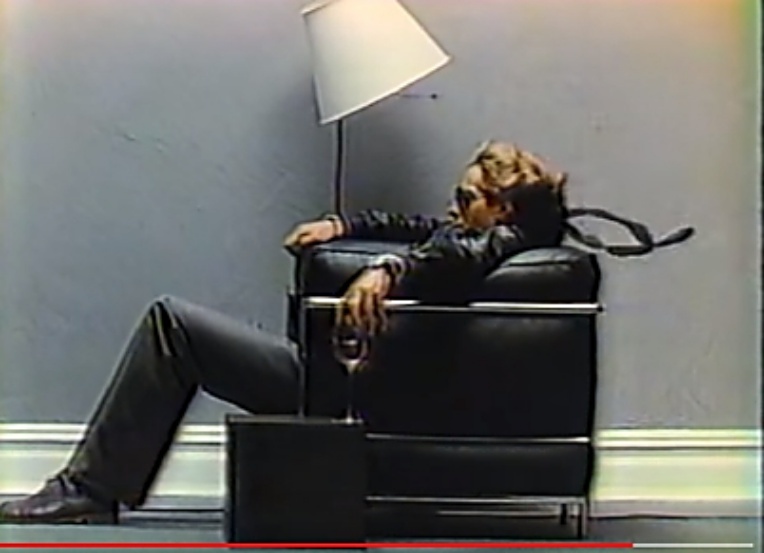 Even if there was a projectionist around to lower the level of this trailer by hand, this lowering of level would take all the excitement out of the trailer and the artistic intent would not be preserved.”18 Some individuals like the loud sound (just like their boom boxes, rock concerts, etc. ), and some seem to react with a “wow” factor as loud sound reaches their ears, while many apparently do not like the overly-loud sound. As a result, because of patron complaints about the loud trailers, some theaters compensated by turning down the trailer sound volume, frequently leaving the volume at this lower setting for the feature film, resulting in much speech being too soft to be heard in the main feature film. In an attempt to solve this problem, the TASA (Trailer Audio Standards Association) was created in 1999 at the request of the National Association of Theatre Owners (NATO) to address audience complaints about excessively loud trailers. This Ad Hoc Committee is comprised of marketing post-production representatives from all the studios, as well as engineers from the digital sound companies, mixers, and independent audio experts. Unfortunately, the TASA Ad Hoc Committee and its “Standard,” are “recommendations,” and voluntary. The Committee believes that the complexity of the problem is such that any solution must be tried and proven in the field. Using this procedure, the actual upper volume sound limit has been adjusted periodically as experience in the field warranted. Prior to TASA’s 1999 implementation, excessive trailer volume was a common complaint in movie theaters. At that time, the loudest measured at Leq(m) 93 dB.19 The current upper limit is Leq(m) 85 dB. This reduction has occurred in stages in concert with feedback from the National Association of Theater Owners (NATO). The range between the loudest and softest trailer has dropped from 15 dB to closer to 5 dB. This makes it easier for theaters to keep trailer sound levels in line without having to adjust volume controls. The TASA “Standard” has been adopted internationally, and by several national standards entities as a recommended practice. It has been voluntarily adopted by all MPAA (Motion Picture Association of America) member studios. Interestingly, commercials in theaters do not lie within the purview of the TASA and the MPAA. Neither group regulates the sound level of pre-show music, slides, policy reels in-theater ads, or commercials in any way. The only emphasis is from the National Association of Theater Owners (NATO), which strongly “encourages” commercial makers to follow TASA guidelines. Commercial loudness should not exceed 82 dB Leq(m), as regulated by SAWA (Screen Advertising World Association). SAWA is the worldwide trade body of screen advertising companies that have relationships with and supply services to the screen advertising industry. It appears that the issue of acceptable (but not necessarily safe, as it relates to potential hearing damage) sound volume levels, especially the maximum sound levels for feature films, continues to remain in motion, but with no firm commitments nor consensus. On the positive side, the direction for theatrical trailers and commercials seems to have been more focused, where in the past filmmakers have routinely mixed these louder than their films for promotional reasons. Many would argue that someone might have forgotten to provide safety information to theater owners about hearing safety levels. Because aside from managing loudness levels that incidentally are somewhat aligned with OSHA recommendations, theaters are generally attempting to direct their attention to managing loud sound primarily for audience acceptance. “Attempt” may be the critical word, according to some. However, there is a growing number of individuals who complain that the sound is too loud and prefer that it be lowered. Consumers have taken active roles in addressing this issue. One such group is the CALMS group (Cut Absurdly Loud Movie Sounds) in the State of Connecticut in the US. One impact of CALMS groups has been reflected in that television stations, cable operators, satellite TV operators, and other pay TV providers must limit a commercial’s average volume to that of the programming that it accompanies. This was accomplished by FCC rules to comply with the general directive of Congress in the Commercial Advertisement Loudness Mitigation (CALM) Act, effective December 13, 2012). No specific penalties were attached for non-compliance. However, the CALM Act does not apply to movie theaters. In 2014 the FCC made an additional minor adjustment allowing commercials to be at an even lower level, but again, related only to TV and broadcast. The purpose of this article was to determine if anything had changed with respect to the management of sound levels since I wrote about this topic in 2014. I would have to say that there is more discussion about managing properly the relationship between dialogue and effects, but for those who continue to insist that some movies are still too loud overall and that dialogue is therefore sacrificed, it appears that there is nothing other than attempts to better restore a reasonable relationship between the two. Perhaps in other ways the issue, at least with certain films, may have gone the other way. Films such as Noah, Dunkirk, The Right Stuff, Empire Strikes Back, Twister, Star Wars, Inside Temple of Doom, etc, have been criticized by many movie goers as being much too loud, and expressing regrets for not having personal ear protection during viewing. At least in the US, there is currently no legislation that I am aware of that is attempting to set output levels of any kind on the movie industry. Still, there are factions that believe that some kind of limitation should be put into regulations, especially to control potentially damaging high SPL bursts or high sustained levels of noise. Certainly, such potential peak levels have been recorded using calibrated sound level meters. Suggestions are offered by Thornton6 for some requirements to start with to turn back to something “normal,” (Dolby fader level 7 with sensible mixes) and proposed how this might be done for feature films, and suggested that these might apply to commercials and trailers as well. However, this is beyond the scope of this article. (1996). Sound effects and bad editing often drown out the dialogue. Los Angeles Times, June 24th. (1996). Who’s been turning up the volume at cinemas? Miami Herald, August 12th. Thom R. (1996). Are movies getting too loud. Journal of the Cinema Audio Society, 3, and from FilmSound.org: http://filmsound.org/randythom/loud-movies.htm. CCIR XIII Plenary Assembly Report 3982, Recommendation 468-1 and Doc X/22 presented in evidence. Warszawa A, Sataloff RT. Noise exposure in movie theaters: a preliminary study of sound levels during the showing of 25 films. Ear Nose Throat J September 2010. Hernandez S, Walker D, Byknish D. Dangerously loud? Monitoring movie theater volume. KXAN In-depth investigative. February 2014. Young W. Writing in Hughes, P. Are the movies too loud? HeartheWorldbetter.com, March 26, 2014. Hughes, P. Are the movies too loud? com, March 26, 2014. Grimm E. (2017). Writing in: Thornton M. (2017). Loudness and dynamics in cinema sound – Part 1. Curry, M. A loud irony enters the mix: the film volume issue. Creative Planet, 2/15/2012. Allen, L. SVP Dolby Laboratories, January 30, 2009. A short primer on the levels of features, trailers and commercials as heard in the cinema. *Much of the content in this post comes from an article written by the author a little over three years ago, but with an attempt to determine if any progress had been made since that time relative to management of the extremely high loudness levels of many movies – levels that are often considered dangerous to one’s hearing. The reference for that is: Canadian Audiologist, 2014 Vol. 1, Issue. Parts for this article are used with permission. The views and opinions expressed in posts do not necessarily state or reflect those of Hearing Health and Technology Matters, LLC. Articles may be republished with permission of the Editor of HHTM. Please read our republication guidelines before submitting your request. Copyright © Hearing Health & Technology Matters, LLC. 2017. All rights reserved. Reproduced with permission. Dr. Staab is an internationally recognized authority in hearing aids. As President of Dr. Wayne J. Staab and Associates, he is engaged in marketing, research, development, education, publishing, manufacturing, and consulting projects related to hearing.